I created this goose last year as a present for a friend of my family. This year I had the honor to be invited to the 25. International German Origami Convention where I could teach this model at a workshop. The goose was designed out of the traditional fishbase. Ich habe diese Gans letztes Jahr für eine Freundin meiner Familie entwickelt. Dieses Jahr hatte ich die Ehre, als Gast bei dem 25. internationalen deutschen Origami Treffen eingeladen zu sein, wo ich dieses Modell in einem Workshop gefaltet habe. Ich habe die Gans aus der traditionellen Fischgrundform entwickelt. 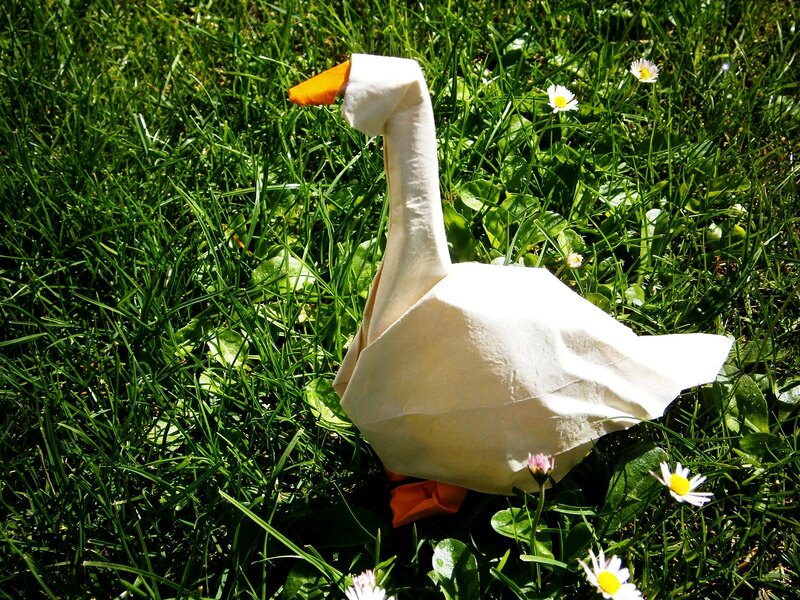 Posted in OrigamiTagged "Daniel Chang Origami", "Daniel Chang", "Gans Origami", "Origami Bird", "Origami Frankfurt", "Origami Gans", "Origami Goose", "simple origami goose", bird, color-change, Gans, Goose, Keep Folding On, Mitanei, OrigamiBookmark the permalink. This reminds me of a goose by David Brill although his is not out of a square. I really like your masks and was wondering if you do full people with faces like Eric Josiel?